Valene and Francisco standing on Monroe bridge and catching the glow of the sun setting on my first wedding of the fall. The last time I shot on this branch of the river was eight years ago, so I was really excited to go back and frame this side of the town. Bride and groom got ready at the beautiful Kimpton Gray hotel, on Lasalle street, and used the stunning marble staircase for their first look. Then we took to the street! From the hotel to Lasalle street. We took family pictures at Buckingham fountain and drove west to South Branch Taverne and Grille. A slice of light isolated their outdoor ceremony and reverberated on the buildings around the patio, adding some magic. The South Branch dining room ready to host the reception of Valene and Francisco, while guests are treated to amazing hours d’oeuvre. The time of the year and the position of Monroe bridge, just steps away from South Branch, are perfect to catch the dramatic light of the sunset. We literally walked into the sun. Party time. 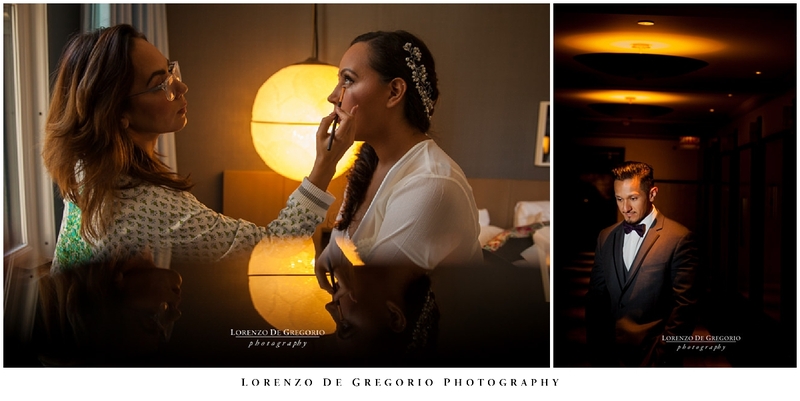 When you photograph a Latin wedding you know you are in good hands. And the father-daughter dance was memorable! If you enjoyed this post then please leave a feedback and share it to let other people know. Getting married in downtown Chicago and looking for inspiration? follow this link to see more weddings I shot in Chicago over the past ten years.